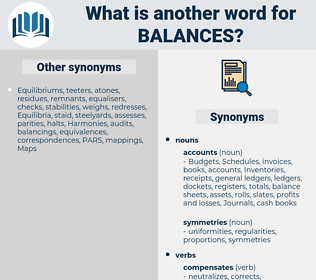 What is another word for balances? accountable, accounting, auditor-general, namely, GONNA, comptes, auditor, auditors, board, Against. liabilities, considerations, receivables, credentials, Achievements, Guarantees, transactions, differentials, placements, assets, chances, banks, variances, restraints, relationships, verifications, relations, bargains, Availabilities, checks, potentials, safeguards, Adjustments, operations, protections, absolute, advances, Expenditures, Currencies, Resources, limitations, discrepancies, arbitrations, experiences, restrictions, receipts, Abilities, shortfalls, reserves, stockpiles, trade-offs, arrangements, constraints, observations, examinations, Evaluations, tradeoffs, authorities, mechanisms, funds, dealings, sales, outcomes, check-ups, distortions, surplus, surpluses, statements, benefits, Records, increase, increases, Disparities, supplies, reports, minutes, reservoirs, sheets, settings, audits, asymmetries, stocks, scores, offsets, amounts, monitors, sums, monies, machineries, inspections, leftovers, checkups, overviews, positions, review, Possibilities, Weights, fonds, caches, Judgments, Budgets, movement, depositions, ratio, ratios, deposits, limits, Los, powers, repositories, margins, together, pools, gaps, disorders, LBS, Branches, pillars, Taxes, Opportunities, plans, PROSPECTS, controls, bills, roll-ups, rollups, Salaries, holdings, exposures, Summaries, Filings, Tests, others, processes, Ones, kinds, Rats, equations, Yours, claims, counts, tanks, Warehouses, stores, silos, figures, depots, avenues, books, residues, pounds, schemes, results, Gains, comptes, auditors. 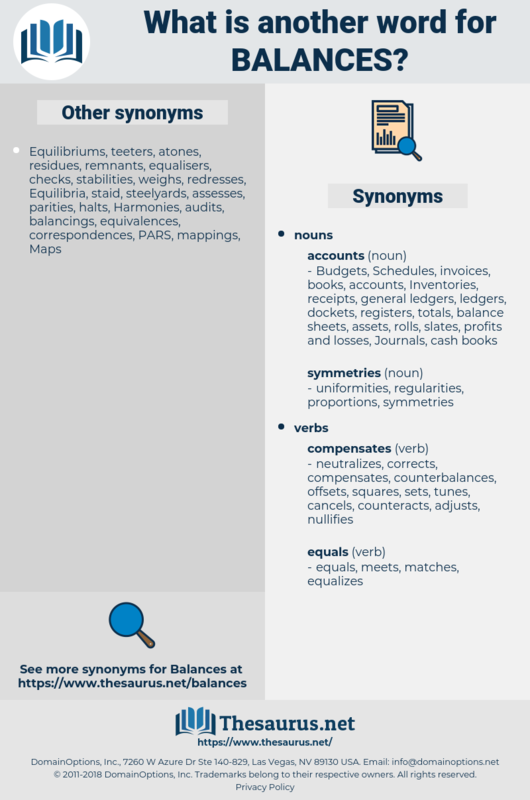 reconciles, incorporates, equilibrates, coordinates, evaluates, combines, integrates, acknowledges, circulates, reflects, sends, clears, apportions, harmonizes, assesses, Addresses, disseminates, harmonises, responds, includes, complies, aligns, dangles, targeting, distributes, deploys, considers, answers, delivers, Replies, Aiming, aims, spreads, resells, safeguards, des, recognizes, outweighs, fulfils, captures, launches, looks, Focuses, seeks, brings, matches, plugs, serves, meets, Kicks, evens, amounts, swings, satisfies, S, results, comptes. The British sugar islands, to which it virtually restricted the West Indian trade of the Northern colonies, offered no sufficient market for their lumber and provisions, nor could they, like the Spanish islands, furnish the silver needed by continental merchants to settle London balances on account of imported English commodities. When the box is with difficulty replaced, the string of the bag drawn, the basket arranged to her satisfaction, the umbrella placed at a pleasing angle, she balances herself upon the edge of the seat, and glances fearfully from side to side as we swing along the smooth road. belling, blemish, blink away, blank check, baffling, blanch, balinese, bull neck, blank, buffalo wing, Blank Cheque, belong, blueness, billowing, ballooning, billings, Blanc, bulnesia, blennius, blowing, bulimic, bullying, bluing, bowling shoe, blinks, blench, Bluenose, blowing gas, balminess, blooming, bowling, blueing, bawling, bolanci, bull nose, boiling, blink, bluewing, bellying, bahia blanca, bobolink, by all means, billing, bullnose, balanus, bubbliness, bellowing, bubbling, babbling, balenciaga, bay lynx, befooling.